As the audience piled into Chicago’s Storefront Theater for Dana Michel’s one-night engagement, the ordinarily dark space was dressed in sterile white drops and white marley. But nothing – absolutely nothing – about Michel’s solo work Yellow Towel is as plain as the space in which it lives. Michel is dressed in a black hoodie and sweatpants. She emerges onstage through a gap in the white curtains, not as a dancer, but like a street person. She writhes her hands, contorts her shoulders, and convulses as though she has some kind of movement disorder. She moves fast, but travels slowly, mostly facing her back to us, and udders speech I don’t entirely understand due to an impediment I later learn is put on. She resembles the people we try to avoid, the people who get more space on the sidewalk than needed, the people you might cross the street for to avoid an uncomfortable confrontation. By sitting in this theater, at that moment, I’m forced to look at this character. Forced to listen to her, see her, and try and make sense of her actions, her speech, and the relatively worthless items that, collectively, are this person’s universe. She holds a mess of Q-Tips in her hat, and stores a trumpet in her pants, which she plays very badly before switching the trumpet for a banana. “I am the creator, and this is my house,” Michel says, before lounging on a noisy pool toy and pouring buttermilk across her chin. There are more props and metaphors than any viewer can rationally keep up with, but the magic tricks of unending props stored in mysterious places, the discomfort of Michel’s convulsing, grotesque body movements, and progressive filthiness of the space are likely exactly the point. As the piece moves forward, Michel becomes less guarded, revealing her chiseled physique in a fantastic pair of mustard colored tights and white tank. Her waist long dreads are unmanageable, particularly as they interact with a clip-on blonde ponytail, a grass pompon, and a raucous gospel song. As a group, I could feel that we (the audience) grew to love this character, if not relate to her. An impassioned speech about climate control – “personal climate control” evolved into a cautionary tale about “conservation, preservation, consummation, and communication,” and how the path toward self-preservation and “making the money” is through a career in meteorology… “Because the sky’s not going anywhere!” she said. The piece ended more abruptly than it started, but Yellow Towel left its audience stunned and silent. We were equally afraid to be the first person to move, talk, stand up, or leave. I can’t say that I liked or disliked Yellow Towel. Michel broke every single rule I’ve ever learned about choreography: there were too many props, too many ideas, it was displeasing, difficult to watch, and at times distasteful… but none of that matters, because living and creating by a set of rules homogenizes art, and us. When I think about my experience at the Storefront Theater last Saturday, I compare it to getting on a roller coaster. Once you commit, you’re locked in and have to do it, like it or not. It’s not fun at times, you want to look away, your gut rises and falls in your stomach…. but at the end, you walk out with a rush of adrenaline and can’t wait to do it again. Note: ‘Yellow Towel’ was presented as part of the OnEdge Festival, a series of free experimental performances presented by the Chicago Department of Cultural Affairs and Special Events and Illinois Humanities. The festival continues through March 4; For a complete schedule, visit cityofchicago.org/dcase. 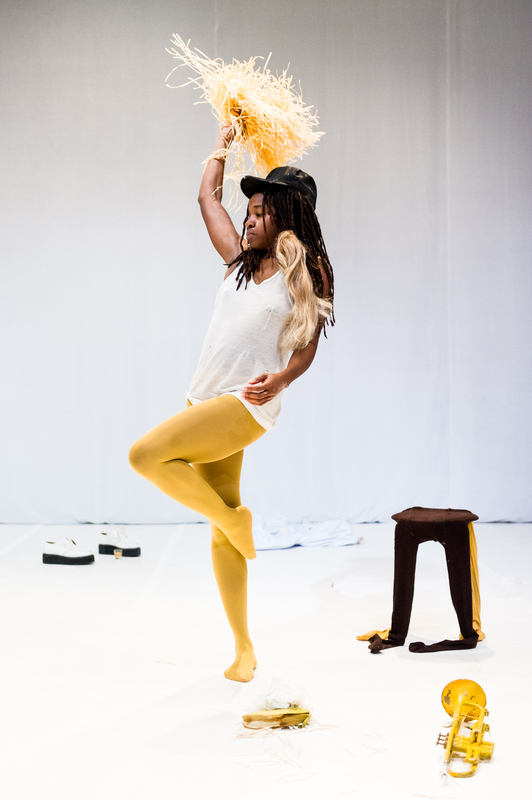 fyi – Dana Michel’s performance of Yellow Towel was also presented as part of the black | body.